Excellent for the pottery studio or ceramic classroom where moderate ceramic dust accumulates. Great for use for occasional clay or glaze mixing !!! Not for industrial or full time use. 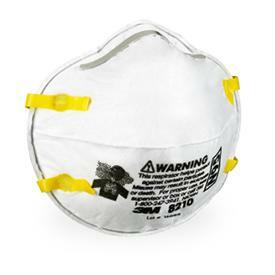 For more industrial application see our half face respirators. N95-level respirator is at least 95% efficient when tested against sodium chloride (salt). Used for solid and non-oil based particles. Applications include grinding, sanding, bagging and general processing of various minerals and other substances that do not contain oil.